Matt and I have recently been re-reading Neil Gaiman’s Sandman series, something that I’ve been putting off doing for a few years now. I’m not sure why we decided to dive back into those books now, exactly – I guess part of it might be because I recently started following Mr. Gaiman on twitter and suddenly remembered how amazing he is. It’s also probably due to the fact that we just recently found the last couple of volumes needed to complete our collection for cheap at a discount bookstore. Mostly, though, I think it came out of how much I’ve been thinking about my friend Annie lately. The thing is, I’ve been missing her like crazy, and I can’t think about the Sandman books without being reminded of her, and vice versa. What I want to make clear here is that Annie was a super badass who dressed all in black, smoked like a chimney and never refrained from speaking her mind, even when she knew it was going to get her into trouble. She was a brilliant actress with a mysterious Soviet past and a deadpan stare that could wither just about anyone. Half the city admired her, half the city was afraid of her, and half the city wanted to sleep with her. And no, I didn’t accidentally say “half” instead of “a third” – I just mean that there was a lot of overlap between all three categories. I had no idea why she would ever want to be my roommate. I would estimate that there are four people who have had an enormous influence on my outlook on music, clothing, art and life in general. The first was Emily, who I met at a performing arts camp when we were twelve and who introduced me to vintage clothing, the Kids in the Hall and, music-wise, everything from Ani DiFranco to Sonic Youth. The second was Kat, who had first hated then later befriended me in while we were at university, and who is responsible for introducing me to pot, Sylvia Plath and the joys of being loud and obnoxious in public. The most recent one was my friend Audra, who has helped shape my take on third-wave feminism, internet activism and dance movies. The fourth, of course, was Annie. I’m not sure, exactly, how Annie and I became friends. I think that it happened slowly, by degrees, with me making tentative friendly overtures like buying her beer and lending her books. Then she invited me out to her birthday and I went, bravely talked to a few of her friends*, then left early. I’m not sure what time she came home at, but the next morning she was still drunk. When I got up, she was lying sprawled out on our couch, her tank top askew and her already-short skirt hiked up even higher, and she kept giggling over everything I said. I made us both breakfast, and then suddenly, magically, all of my awkwardness melted away and it was like we’d known each other forever. Mostly it feels like Annie and I have the kind of friendship that twelve year old boys have. I mean, you know that part in Stand By Me when they’re sitting around the campfire talking about pez candies and Wagon Train and whether or not Goofy’s a dog? And then narrator-Gordie says, “We talked into the night. The kind of talk that seemed important until you discover girls.” That’s what our friendship felt like then, and still feels like now. And if you’re an aficionado of Stand By Me in the same way that Annie and I are, I probably don’t have to explain that she’s Chris Chambers, and I’m poor old Gordie Lachance with the leech on his balls. Anyway, that summer, the summer of 2004, Annie introduced me to the Sandman series. And as I worked my way through them, she re-read them, and together we fed each others’ obsessions. We would sit out on our North End stoop as the late afternoon cooled into evening, drink whatever we had on hand, share Annie’s pack of cigarettes and try to pull apart the Sandman universe. We teased out each layer, or at least the layers that we could find, and laid each thread of plot bare to examine it. We researched everything, trying to figure out which characters were historical figures and which were just plain made up. I think at some point we even made a flowchart or graph to keep track of our discussions. It was perfect. That summer was like gorging on everything wonderful in life all at once, and if I could bottle it up and sell it, I could be a millionaire, like, tomorrow. I’m not including a picture of myself because I look nothing like Delirium, but when I first read those books, I felt like her. I understood the stuff she said, even when most other people, both fictional and real, seemed to have no clue. I loved Delirium. Loved her. 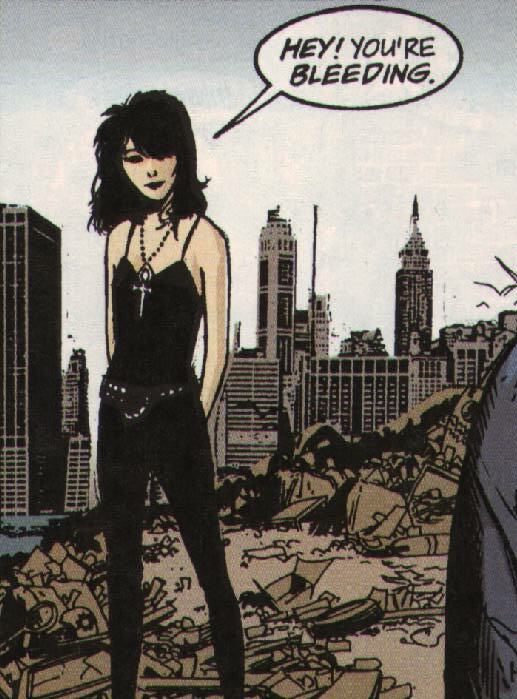 I think my adoration for her was part of the reason I put off reading the Sandman books again for so long – because, of course, it’s dangerous to revisit anything that you’ve known too well, loved too deeply, or somehow view as having helped shaped who you are. It’s dangerous to expect something to feel the same after years and years of memories and expectations. Sometimes, if you’re lucky, those old books, movies and places are able to stir enough nostalgia to allow you to overlook all of the failings you’re suddenly able to see, but mostly going back to the things that you view as influential and formative is nothing but a disappointment. First of all, they can never live up to the hype that’s built up in your mind for the last ten or fifteen or twenty years, and second of all they’re often just plain terrible and end up making you feel as if a huge chunk of your childhood or young adulthood is somehow tainted. And, see, Delirium is a character who would be ripe for this kind of adult realization. I was worried that, as a 30 year old, I would find her character to be ridiculous, and my love of her incredibly pretentious. 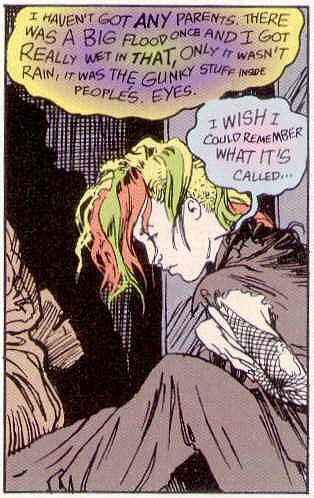 I was worried that re-reading Brief Lives, my favourite Sandman of all time, would leave me rolling my eyes SO HARD at my younger self and her habit of being overdramatic about, well, everything. I was worried that, this time around, I would hate Delirium, or at the very least no longer love her and know her the way I had. And somehow, that would feel like a huge loss. But you guys? Sandman is still amazing. And Delirium is still amazing. Maybe it’s because when Annie moved in with me, I was just coming out of a major depressive episode, and I’m in a not-dissimilar place in my life right now. Or maybe it’s because I haven’t changed as much in nine years as I’d thought. Whatever the reason, Delirium still kills me in all the best ways possible. She says things, and I think, ohhhh, I get that. I’ve felt that. I’m not really sure how to end this, except to say that I find myself back in the same curious, dreamy state that Sandman put me in the first time. I mean, it’s probably not just the books – it’s probably also the fact that spring is so close that you can taste it, and that my house is clean for once, and I ate some really transcendentally great yogurt today. But whatever it is, I’ll take it. I like this feeling. I’ve missed this feeling. It makes me feel floaty and insubstantial and wondrous in a way that I haven’t felt in years. I just wish Annie was here to share this all with me, instead of being half a continent away. I wish we were back on our stoop, eating Rassy’s pizza and drinking Kahlua cocktails and watching the sparrows hopping around eating our crumbs. I wish I knew what to do with this feeling, now that I finally have it back. *It was actually only one friend, the nicest guy imaginable who would deliberately seek out shy, awkward people and talk to them at social gatherings. Seriously. The nicest.